I will therefore only deal here with a few obvious falsehoods. 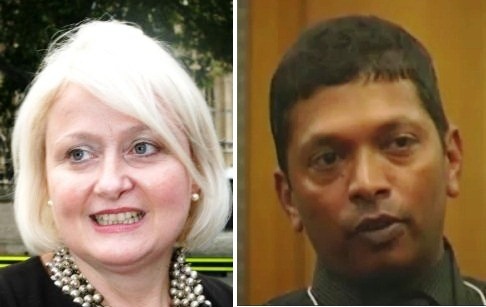 The claim that there were only three Tamils present is falsified by the article itself, which launches the usual attack on Mrs Rajeswari, with the claim that she ‘the mouthpiece of Sri Lankan government alleged that Channel 4 is trying to create a war in Sri Lanka again and requested that Tamils should be allowed to live peacefully. She also blamed the leadership of the LTTE.’ The others, Tamil as well as British, who made a similar point are ignored, since Mr Daran wants to present the event as a battle between three Tamils and 150 Sinhalese. He does grant that ‘Four British MPs were present during the screening of the video but three of them left the hall in the middle of the event’. This ignores the peers who were present, and the fact that the MPs left when a division was called, and many of them came back. The one who failed to do so was Siobhain McDonagh, but she had of course left two researchers behind. Entertainingly, Daran claims later on that ‘It was interesting to note that only four British MPs attended at this event and they fell into sleep immediately after few minutes of commencing the screening’. Another blatant falsehood was the claim that one of the Tamils present condemned me for talking about ‘Tamil terrorists’. In fact, as the video footage makes clear, he was talking about an intervention from the floor, and I in fact supported his plea and asked that all of us, however emotional we felt, make a distinction between the terrorist Tigers and the Tamils, whose welfare as equal citizens of Sri Lanka must be supported. Finally, Daran claims that a journalist from Channel 4 ‘managed to infiltrate’ and ‘raised many questions to the disappointment of GoSL’. On the contrary she refused to answer a question raised following Daran’s assertion that Channel 4 had claimed their video was not edited and this had been authenticated, as he put it, though he could not say by whom. Later he declared that it was by the American Institute of Technology, but the only institution of that name that Google turned up was a driving school. Doubtless Siobhain McDonagh has her reasons for using such a confused young man as a researcher. But what is even more startling is the evidence of his involvement in even more vicious forms of Tiger propaganda. Having told me that he would send the material that substantiated his claim that hospitals had been shelled, he later said that ‘after careful consideration, I can’t give you that entire video’. Instead he sent me simply the section of Dr Shanmugarajah talking, which was nothing new since I had been asked to comment on such when they first came out, and had then made clear my view that the poor man and his peers were under pressure from the LTTE. I told Daran that I had been surprised he had agreed to send me the whole, and was sad he felt he could not do this. My query about when and where the bits he sent were taken remains unanswered, as do similar queries about the other pictures he sent. For the young man could not let well alone, and sent me two more excerpts. One, which he accompanied with the claim ‘This is shocking? Isn’t it?’ had pictures of aircraft and then smoke at a distance, after which there were scenes of dead bodies and wailing. I suspect this juxtaposition will repay analysis, and have asked that this be done. The third extract was ghastly. The text here was all in capitals, ‘HAVE U SEEN THIS?’ and was of a soldier who had had a bullet through his head, so that one eyeball goggled while the other was missing. Those carrying the dead body were speaking in Sinhalese. I found the whole sequence ghastly as well as strange, and I asked him whether this was ‘some sort of trophy video and when it was taken and shown?” Needless to say, there has been no response. The first question to ask is, what is Siobhain McDonagh doing with a young man like this, who triumphs over such pictures, while refraining from sharing anything that could count as evidence for what he claims? But I think there is a more serious question, which is, what is a young man like this doing with a dangerous woman like Siobhain McDonagh? For we can understand that youngsters were carried away by the Tigers and their dangerous glamour. But, once the Tigers in Sri Lanka were destroyed, it should have been possible for these boys to transfer their energies to the welfare of Tamils, and not hanker after a renewal of separatism through violence. Unfortunately, they are out of touch with what goes on in Sri Lanka, and so fall prey to continuing extremism, which is fuelled by those British politicians who derived advantage from the previous connection. Joan Ryan is now working for the Tiger rump. Siobhain McDonagh was hand in glove with Channel 4 when they produced their film, and doubtless introduced boys like this with their horrific video footage to those who could manipulate and make use of it. I feel I was right then to have prefaced my remarks at the House of Commons with a reference to Conrad’s ‘Heart of Darkness’. A few people read that as a reference to the Congo, and the ‘unspeakable’ horrors Conrad describes as going on there. More see the title as referring to Kurtz, who goes out with ideas and succumbs to the darkness that is still placed out there. But Conrad himself ends the story with a reference to the connections that are pervasive, and wind their way to London. As he showed in this other stories, where terrorism is corrosive, those in the West should also be aware of how their involvement can exacerbate the horror, the horror. Sri Lankan documentary against Channel 4 film: A flop. A video has been produced by Sri Lanka in response to the Channel 4 film “Sri Lanka Killing Fields” which was screened in many parts of the world including at the Parliaments of many countries. The Sri Lankan government screened its video in the British Parliament premises yesterday and made an effort to get many MPs to view it. Tamils who came to know about this made attempts to participate at the event and to raise questions on the video. GoSL when came to know about it, announced that, the screening is only for the British MPs. Even though, this announcement denied the opportunity for many Tamils who wanted to make questions. Three Tamils including the journalist of Athirvu.com website managed to gain entry into the hall. The video was screened first and Q & A session followed by that. Four British MPs were present during the screening of the video but three of them left the hall in the middle of the event. A journalist from Channel 4 managed to infiltrate despite the restrictions to prevent the entry of the Channel 4 and raised many questions to the disappointment of GoSL. Subsequently the journalist of the Athirvu.com website also raised questions. He asked, “why don’t you allow an international investigation as wanted by the West instead of screening videos to counter the allegations of Channel 4 in order to gain the support of the West”. When the Sri Lankan spokesperson avoided a direct answer to that question Mr. Amza who was seated in the front row intimidated the journalist by indicating that he is being video graphed. Another Tamil participant who rose to condemn the comment of Mr. Wijesinghe for the reference of “Tamil terrorist” said that “when you say Tamil terrorists it imply that all Tamils are terrorists”, Rajiva Wijesinghe replied stating that he regrets if he had said so. Only three Tamils were there to make questions among about 150 Sinhalese, whenever Tamils got up to speak, the Sinhalese shouted at them and ridiculed them. The Channel 4 journalist was also subjected to same humiliation. When the Tamils were moving out of the hall at the end of the event they were surrounded by the Sinhalese to lodge their protest. The journalist of Athirvu.com website and other two managed to come out and shared their experience with other journalists. It was interesting to note that only four British MPs attended at this event and they fell into sleep immediately after few minutes of commencing the screening. Mr. Rajeswari, the mouthpiece of Sri Lankan government alleged that Channel 4 is trying to create a war in Sri Lanka again and requested that Tamils should be allowed to live peacefully. She also blamed the leadership of the LTTE. In total, it was evident that the video drama of Sri Lanka in the UK became a flop. Despite the presence of 150 Sinhalese, the questions raised by the three Tamils made the speakers of the Sri Lankan government upset.